There are two kinds of angry people when it comes to anger management. There are those who don’t want to change because they don’t see any reason to. People who don’t want to change a behavior generally don’t. There is no way you can make another person change when he doesn’t want to. The second kind of person does want to address his or her anger and learn new skills to deal with angry feelings. You must be desiring change if you are reading this article. Actually there is a continuum measuring how much people want to change. Plato told us that “The beginning is the most important part of the work.” And there is no better time than right now. Remember, what you are working with are feelings and energy imbalances. Feelings are meant to be felt, given a name and then released. Stuck feelings are energies that want to move! So what’s your excuse for not changing? I can’t help it – This is just how I am! Huh? Why me? Why should I change? Some what, lukewarm > I’m getting there > Complete makeover to get a new life! Sit quietly for a few moments and reflect on what is not working in your life. Determining the reasons is a major tool for increasing motivation. Obviously something is not working in your life regarding anger for you to be reading this book. So remind yourself that you are the architect of your own life and ask yourself what you really want. Here are the most common reasons for desiring an anger makeover. Tap briskly all over your body to energize yourself around these beliefs while contemplating your reasons for doing an anger makeover. _____ I choose to develop a higher positive sense of self. _____ My conscience nudged me saying that my behavior is inappropriate for a person my age. _____ Something happened that shook me up and made me take a good hard look at myself. _____ I don’t like who I’ve become and want to be a better person. _____ I want to keep from losing someone who has put me on notice regarding my anger. _____ I want to enhance my relationship with _____. _____ I need to model better ways to deal with stress for my children. _____ I want to increase the quality of loving in my life. _____ I want to prove to myself I can live in ways that are consistent with higher values. _____ I am disappointed with myself and feel remorse after becoming angry. _____ I need to reduce my negativity and live with courage, trust and gratitude. _____ Analyze it as an emotion, behavior, hormonal and physiological response and defense. _____ Keep angry thoughts on my daily radar screen and apply what I’ve been learning. _____ Reflect and meditate on ways I can grow and change. _____ Analyze my anger when it comes up and do it differently the next time. _____ Catch my self-angering talk and challenge it each time it occurs. _____ Slow the quick anger response down by breathing so that I can make a better choice. _____ Do the Cognitive Behavioral and Energy Psychology exercises given in this book. _____ Learn and use the stress management techniques when I become angry. _____ Learn and use better boundary-setting skills and use fair-fighting skills. _____ Do a Time Out to calm myself and see the issue from the other person’s perspective. You may always have a tendency to get angry. That’s okay. Anger is a normal emotion but remember it’s what you do with anger that counts. A good rule of thumb is not to use anger to hurt others or yourself. Our actions should support life and growth. Eternal vigilance will be required for you to step out of your old ways of acting into fresh strategies that improve your self-esteem and relationships. Changing a behavior and resolving to make the change permanent takes some doing. Understanding how change works will help you determine your readiness for making the new behavior stick. The process of change is a six-step process according to researchers James Prochaska, John Norcross and Carlo DiClemente. Where are you among this process? Pre-contemplation: You are unaware or under aware of your problem. If you are aware of it, you don’t intend to change. Contemplation: You become aware of the problem and how it has hurt you and give serious thought about changing your behavior. This is the “Maybe I should” stage. Preparation: You start to think about the value of how you might be different and begin to have strong intentions about change for the future. You generate alternatives to the way you address the problem and list pros and cons for each. Action: You choose a standard, set up a plan and commit to it. You actively work to modify behavior and overcome problems. You keep at it even if you get bored with it. Enlisting a buddy to join you in your action plan will strengthen your resolve. Maintenance: As your habits change, you may still be identifying with the problem but you continue to work to keep your behavior to the standard that you have set. Much recognition and reinforcement is needed at this stage as you struggle to maintain your gains. It will take as much as three months for a new behavior to be established so you don’t go back to your old ways of doing things. You may slip up now and then but you quickly get yourself back on board. Permanence: You’ve got the new behaviors down pat and won’t go back to your old ways. You are confident about your success. All behavior has purpose. Be aware a part of you may not want to move on and let go of the hurt and betrayal or the payoffs for anger. If this is so, go back and reread about Psychological Reversals and the reasons for not addressing harmful behaviors. We hold on to things for a reason; there is some payoff. That’s okay up until now but this is the time to help this part grow up and assist you in your search for growth and wholeness. Recognize the part that wants to hold on to anger and revenge as a way to keep-itself-safe defense. How has this hurt and angry part protected me? How has it kept me safe? What do I have to gain by holding on? What does this part of me really want? How could this part of me stay safe in more positive ways? How could I rename this part and give it a new job description? What decision could I make next time? Mistakes happen and they are for learning; practical folk wisdom says to learn from your mistakes. That is the concept behind Error Correction where you analyze what you did wrong and learn from it. If you beat yourself up after an anger attack, stop the blaming approach and turn on the learning approach. There are two forks in the road that you go down after doing an unwanted behavior. One signpost points to The Road to Self-Blaming while the other points to The Road to Learning. Blaming yourself for wrongs perpetuates the wrong doing because your energy goes into feeling bad and angry about yourself. Instead why not resolve to put your energy into what you need to learn. Hurting yourself or others with cruel words is an unnecessary bad habit and can cross over into self-abuse. Pain can be a great teacher if you allow it to motivate you to make drastic changes in how you think and act. One man who used his rage and quick verbal thinking to bring others to their knees finally woke up to becoming accountable. He said that he had started using his deep emotional pain about the mess he had made of his life to make himself a better person. He started a self-responsibility notebook which he carried around to jot down when he felt remorse and emotional pain around what he had done. Before long he noticed the pattern of what he said that kept him and his family in turmoil. He adopted a slogan of “I’ll do the next best right thing in tricky situations” and changed his life. Self-derogatory anger is a bad habit you can overcome. You may get angry at yourself for your mistakes or when you’ve blown up in a way that makes you feel embarrassed. Decide what you want and the type of person you want to become. Decide what you will have to do to become this person. Listen to what you think and say. Monitor your language to catch and interrupt yourself during self-imposed pity parties. Change your victim talk from (I can’t _____. I never could _____. I’m no good at _____. Etc.) to language that affirms positive thinking. Read five books that emphasize the power of positive thinking to saturate your mind in new ways of thinking. Listen to empowerment tapes and watch videos to change the way you address yourself. Confront the critical voice within that tells you that you are not worthy. Whose voice is it? Is it the voice of your angry mom or dad or a previous partner? Discount the thought, say “No!” at it and interrupt it by switching to a healthy thought pattern. Be firm but gentle as you interrupt these self-condemning voices learned from angry people of the past. Determine how remaining a victim keeps you from taking risks and pays off for you. Examine victim patterns in your parents and relatives. Place yourself around positive people who are committed to growth and well-being. Invite your friends to lovingly confront you when you get in the victim role. Watch for hidden messages about not deserving to be healthy, successful or have loving relationships that sabotage your well-being. Negative thoughts that keep you perpetually stuck are called memes. Make a pact with yourself to be responsible for disruptive thoughts that keep you doing the litany of coulda, woulda, shoulda and being mean to yourself. Some anger at yourself is about not setting boundaries. You may be furious at yourself if you don’t speak up and say what you don’t like in a situation. At times someone may be stepping on your toes and you allow it. Rather than address the issue and set things straight, it seems easier to push your anger down. We do get out of sorts when our values our transgressed. If you allow your values to become trodden upon there are two places for the anger to go-at the other person or at yourself. Your value failures may come from your not being able to give yourself permission to speak out for fairness. Are you a Yes Man or a Yes Woman to keep the peace? When you say yes frequently when you know you really want to say no, your self-esteem slips. So the next time you feel your values being stepped on by someone you care about, give yourself an honest pep talk and ask “Do I need to have a heart-to-heart talk with him or her?” If you value the relationship and want to learn to be a straight-forward-talking person, it’s only fair that you try to do all that you can to correct unfairness. To break into destructive memes, you have to challenge them whenever they come up. Affirm their opposite meanings. Write your own positive thoughts that define how you want your life to be. Post these reminders wherever your eyes can catch them. Catch any beating-yourself-up thoughts and surrender them to the Universe. Learn to let go of that which you no longer need. You are certainly worth doing all the work that it will take to change unhealthy ways you think and act when your boundaries are invaded. Want the NEWEST ideas on how to work with your anger? 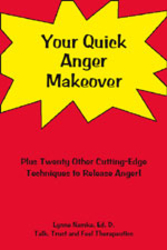 The book, Your Quick Anger Make Over: Twenty Cutting-Edge Techniques to Release Anger is available from Talk, Trust & Feel, Therapeutics.